Inquire about reduced rates for one or two couples. Upper level designed as two bedroom home. No interior stairs to lower level. 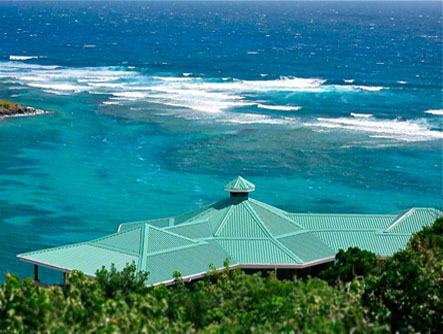 Reef House, which was completed in June, 2011, is perfectly located just a short stroll down the hill to the stunning and often deserted Crescent Beach, and yet is just a 7 minute drive away from Port Elizabeth, Bequia's Harbor, filled with shops and restaurants. 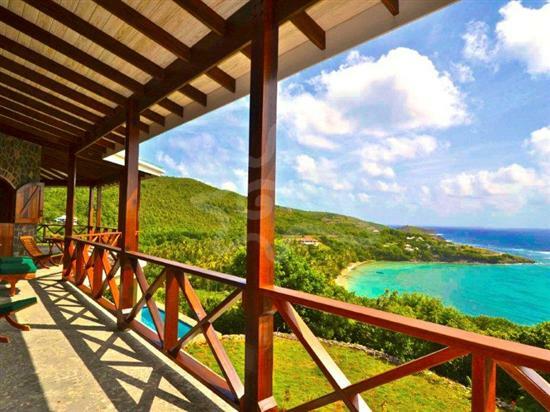 Reef House has been designed in a traditional Caribbean pavillion style featuring terrazzo stone floors crossed with planks of hardwood, tall arched wooden Dutch doorways and rooms that open to a ten foot covered veranda with captivatitng ocean views. The villa is both sophisticated with modern amenities yet embraces the Bequia "barefoot chic" that characterises this island. All rooms are cooled by the constant tradewinds that circulate through the custom designed wooden shutters and doors. There are also ceiling fans in all the five bedrooms. This villa has been lovingly constructed with local cut stone walls and Greenheart tropical wood doors and rafters and is filled with exquisite teak furnishings imported from Bali. With more than enough space for ten guests, Reef House promises to be one of Bequias' finest places to spend a relaxing holiday. This hillside villa has been constructed upon two levels. The upper level features the master bedroom & bath, dining porch, octagon shaped living room & kitchen, plus one guest suite. The lower level contains three bedroom suites plus media room - all with easy access to the plunge pool and pool veranda with its views of the sea and the reef's constantly breaking waves. A media and TV room is located on the ground floor close to the pool and pool deck. The land upon which this villa has been built has been tastefully landscaped with handsome dry stack stone walls and a wide variety of tropical trees and flowers. Stunning views of the ocean, off shore islands and the reef's breaking surf are featured from every aspect.